Eco Grass Matting safety surface is placed over existing grass areas. The holes in the eco grass matting allow water to pass straight through the mats and into the ground allowing excellent drainage. it is a very cost effective safety surface system. 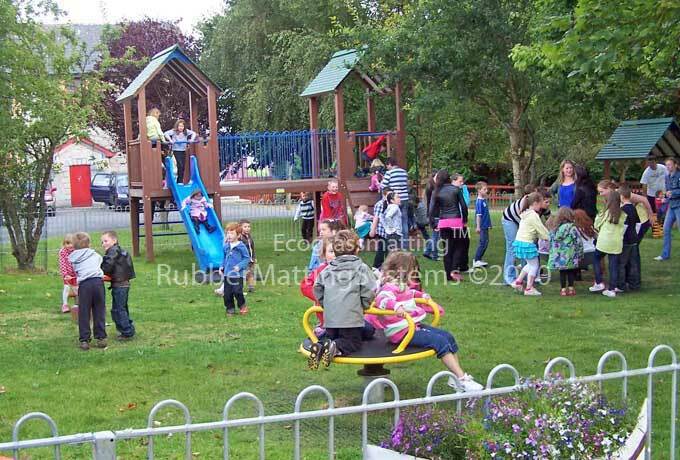 Eco Grass Matting is an excellent product to use where retaining a natural environment and eco theme are important, such as parks, forest parks and schools. Eco grass Matting becomes invisible after 5 or 6 weeks of grass growth as the grass grows up through it. Look closely at the photo above. You can just about see the eco grass matting around the roundabout due to the heavy wear. 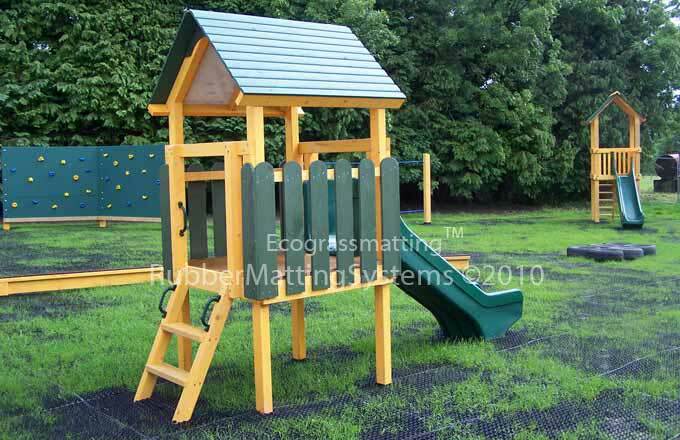 This entire playground is protected with eco grass matting (approx 800m2). Creation of discreet road ways for emergency rescue vehicles eg fire appliances / ambulances. 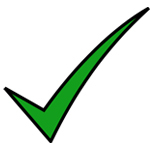 There are 3 major elements of cost savings that can be achieved. 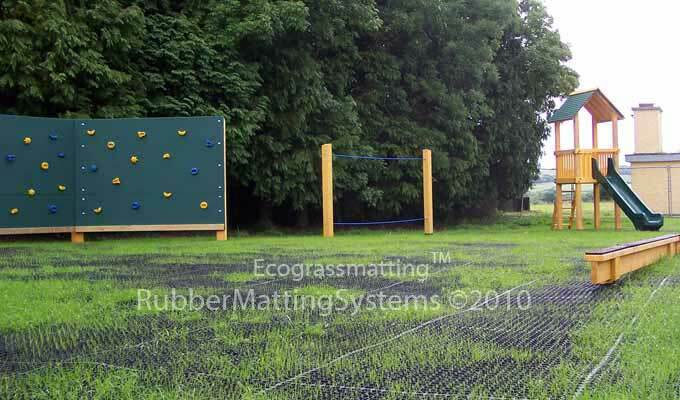 Eco safety Grass matting is a commercial grade rubber grass matting system. It is designed for long life,in excess of 20 years. it is exceptionally durable and is made up mostly from recycled rubber. It is an eco product on 3 counts: firstly it has an 80% recycled rubber content, secondly it can help prevent flash flooding and thirdly it ensures that a park or school grounds has natural grass cover for fauna and flora as well as ensuring that it retains a natural aesthetic. How does the Eco grass matting safety surface work? The eco grass matting when installed over a grassed area (with a minimum of 200mm of topsoil) has an exceptionally high safety rating, up to 3m critical fall height. This is because the impact value is the combined impact absorption of the rubber matting and the top soil / sod below the rubber matting. 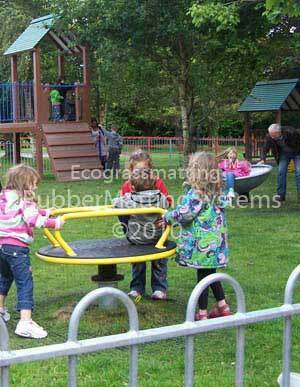 For School playground, public playgrounds and parks. we always recommend using a high strength stabilisation ground re-enforcement mesh between the matting and the sod/topsoil as it distributes the load more evenly, particularly in wet areas or areas with heavy foot traffic.